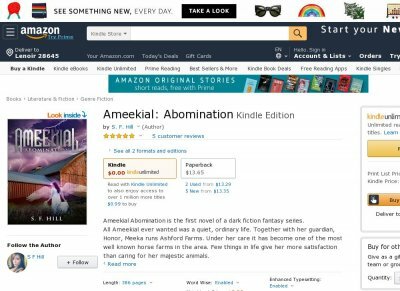 Ameekial Abomination is the first novel of a dark fiction fantasy series. All Ameekial ever wanted was a quiet, ordinary life. Together with her guardian, Honor, Meeka runs Ashford Farms. Under her care it has become one of the most well known horse farms in the area. Few things in life give her more satisfaction than caring for her majestic animals. Despite that, Meeka knows that something is just not right. There is an underlying darkness nearby and it threatens all she thinks she knows. That darkness manifests when disaster strikes Honors best friend. They invite him and his daughter in, caring for them as only family can. Meeka soon discovers that was her first mistake. She questions what she once knew for truth. Honor also feels the effects and begins to act strange. Old secrets resurface and threaten to reveal themselves to Meeka. He begins to understand that all his efforts may have caused more harm than good and that his task was a failure. Meeka comes to accept that the world she has known is all but a veil of deception, and soon she will be faced with making the decision of whether to become the savior of the darkness, the messiah of the damned, or allow herself to be judged for what she is, by the light, and accept her fate as the abomination.